Your employees can be your biggest liability when it comes to a worrisome economy, low pay, or even personal desperation. No employer can control the factors that influence an employee to steal, and there’s no surefire way to determine which employees are higher risk. But you can prevent the way they see and handle your money, with drop safes. Drop safes not only make it more difficult for employees to steal, but they send an unspoken message to your team that you don’t take business lightly, and that safety is important to you. An employee who sees security measures in place is less likely to plan a theft than one who watches operations flow by with no protection, and, seemingly, no emotional investment in whether or not a few dollars disappear. 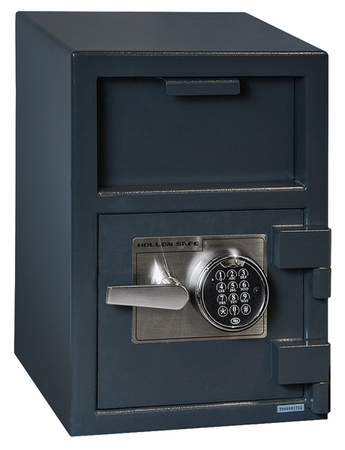 Drop safes allow regular deposits to be put in the safe via a entry-only door. Deposits can be made by virtually anyone, but only someone with the combination can open the safe and remove the contents. For busy cash registers, this means your employees can regularly drop excess cash into the safe before it builds up to too-tempting proportions. Likewise, a register that is regularly emptied is less tempting to an outside thief. The vast majority of thefts are done as inside jobs, or at the least, by thieves who make themselves familiar with the business before making their move. Drop safes provide an extra level of protection, and in all but the most extreme cases, the only level of protection you’ll need. Looking for a safe where you can store your media safely and not have to worry about it being destroyed in a fire? A normal fire safe will not work to keep your data and media safe. Unless you put a safe within a safe it is important and necessary to get a safe that is designed to offer the protection needed. Although the item might not be physically harmed by the fire, the temperature that the safe can reach in a fire is high enough to erase the data stored on the devices, leaving you a useless object, thus reaching the importance of a media safe. I was doing some searching the other day on some data and media safes and came across an excellent blog. “Think ahead and purchase a media safe,” discusses the pros to having a media safe. It also gives the information most people do not think about when creating just a single back up of all their important document.